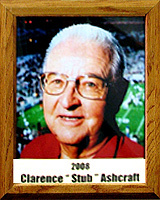 Stub came from Phoenix Union High School to the University of Arizona and played varsity football, 1938 and 1941 and freshman football in 1937. He was a member of the “A” Club for each of his two seasons on the varsity. Stub belonged to the Sigma Nu Fraternity and was vice-president (1938) and president (1941-42). He was elected president of the Junior Class (1939-41). Stub was a member of the Arizona Roughriders Military Honorary (1940-42), the Army Reserve Officers Training Corps, and the Wildcat Brigade (1937-42). He studied journalism and served in the U.S. Calvary Reserve as a 2nd Lieutenant and was called into duty shortly after the invasion of Pearl Harbor. Stub served with the U.S. Army 96th Infantry that invaded Okinawa and Leyte, and was awarded a Bronze Star for meritorious service (1945). Stub was the University of Arizona’s first Athletic Events and Facilities Coordinator and served 18 years in that role (1964-82) and helped open McKale Center in 1973. He belonged to many civic organizations and received numerous awards for his contributions to the community. Stub Ashcraft passed away in 2008.